The election is over, but President Obama is already tapping his campaign e-mail list to press Republcans into a tax retreat. The election may be over, but the Obama campaign’s e-mails are still coming. On Monday, Obama campaign aide Stephanie Cutter e-mailed supporters asking for help in pressuring Congress to back the president’s tax plan. And in contrast to many past forays into Obama’s e-mail advocacy—which focused on broadly “building support” or thanking Democratic politicians who were already on board—the new effort aims squarely at the GOP. Republicans are holding “middle-class tax cuts hostage,” writes Cutter, “because they want to cut taxes for millionaires.” (That may sound like political rhetoric, but it’s literally the House GOP’s current stance.) 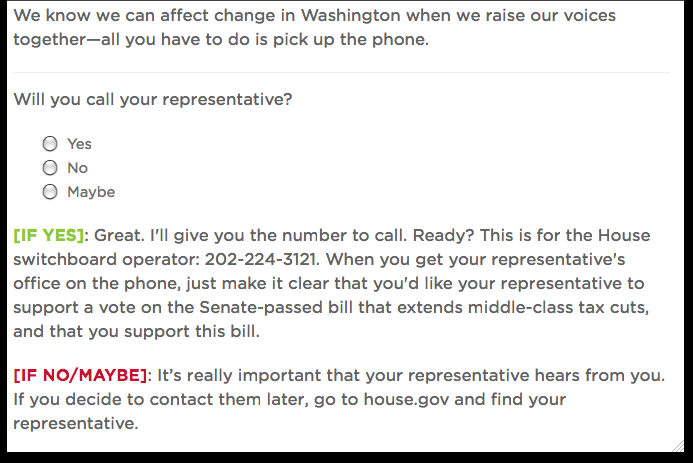 So the campaign is pitching a new online calling tool, which enables people to call their Republican representatives or, if you live in a blue area, to call fellow Obama supporters in redder pastures and urge them to get on the phone. That’s pretty sophisticated activism. No volunteer time is wasted on Democratic representatives or the Senate, for example, which already passed Obama’s framework. The strategy also uses the web to mobilize phone bankers offline. The model begins with the most motivated and connected activists—people who open Obama campaign e-mail, fire up a call tool platform and actually get on the phone. But then it bridges out to potential volunteers who might be less engaged now, or completely offline, and makes it easy for them to participate with just one call (a breeze compared to GOTV). The call script provides a phone number for the House switchboard, so the second caller never needs to log on to the call tool. But the call tool still registers that call, because the first volunteer posts it—so OFA can track who is volunteering and map which GOP districts are getting pressured. This effort to tap Obama’s e-mail list, which has reportedly grown to 16 million people, also reinforces grassroots campaigns to peel off some House Republicans for an up or down vote on the tax proposal. Congressman Tim Walz, backed by Minority Leader Nancy Pelosi, is currently pushing a “discharge position” to force the direct vote. While bills don’t usually reach the House floor without the Speaker’s support, a discharge position can force a vote if it garners 218 signatures. Just like the mounting attention for reforming the filibuster, the public focus on the arcane tactics of discharge reflects an awareness that electoral victories are not enough—when majority rule is so routinely obstructed in the Congress. It’s a good sign that Obama is beginning to use his massive list not only to echo his preferred policies, but to build outrage and pressure on Congress to actually vote on legislation, rather than block it. Some Republican members have said, after all, that they do back middle-class tax cuts. Now all they have to do is sign on the dotted line. "This email represents a critical shift in Obama's political strategy. Paid for by the Obama Victory Fund 2012, it is not aimed at re-electing the President–the ostensible purpose of that campaign entity–but at moving his legislative agenda. It is the President using his army to go directly in the face of Members of Congress who are perceived to stand in his way." George Zornick is keeping a close eye on the fiscal cliff negotiations. In his latest, he says whatever deal is struck must address unemployment.